Young are born 33 days after mating, and spend a year in the pouch before weaning. 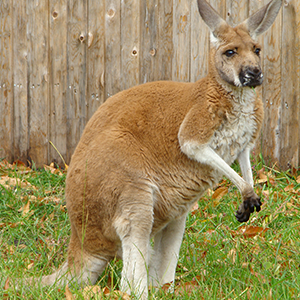 A female kangaroo is called a doe, flyer, jill or roo; a male is called a buck, boomer, jack or old man. A mother kangaroo can produce milk of two different types to feed two different babies at the same time. One that has emerged from the pouch but is still nursing and a newborn.